These bars were kind of an experiment bar...and they came out tasting a little bit like heaven. When molasses and pumpkin get together and make a baby, these are the result. Seriously. If you are looking for a different pumpkin bar recipe, this is the one for you. These would a perfect addition to a Thanksgiving dessert bar line-up. We all know that pumpkin cheesecake with a gingersnap crust is extremely popular (because pumpkin and gingersnap together work like magic). They are pretty sweet, so small bars is key with these babies. I adapted the recipe from a Land O Lakes butter recipe. 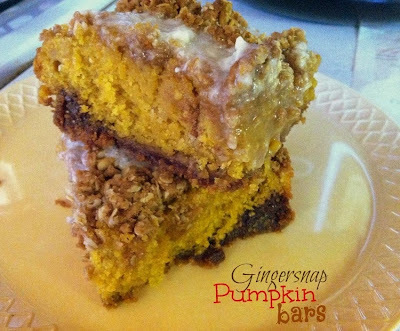 I used their gingersnap crust recipe and made my own pumpkin bar concoction to use as the filling. So, wipe the drool off of your chin and go make these. Now. You will l.o.v.e them. In a large bowl cream together the sugar, butter and molasses. Add flour, baking soda and pumpkin pie spice. Reserve 3/4 cup of the mixture in a small bowl; add the oats and mix well until crumbly. Set aside. Press the remaining mixture into an ungreased 9x13 baking dish or a 10x15 jelly-roll pan. In a large bowl cream together the sugars, pumpkin and eggs. Add the flour, pumpkin pie spice, baking soda, and baking powder. Sprinkle the reserved crumbles with the oats over the top of the pumpkin filling. In a small bowl, mix together the butter, vanilla, powdered sugar, and milk until drizzle reaches desired consistency for drizzling over the top. Drizzle over the top of the cooled bars. My 21 year old stopped by, found the pan of bars and said, "Did you make these cuz these are delicious!"